The ending scene where the young boy Joey, wide-eyed Brandon De Wilde, is crying out to Shane as he rides off into the dark is one of the most memorable moments of classic western cinema. I don't think Jon will agree with you. The scene where he was watching Shane put on the gun shooting demonstration, showing those big bug eyes of his was kind of creepy. He might have been a good fit for Village Of The Damned. All it takes is a little quick thinking and 11-year-old Preston Waters' life becomes a million-dollar adventure! When a crook runs over Preston's bike, he thinks it's his unlucky day. But when a quick settlement puts a blank check in his hand - he fills it out for a million bucks! Now Preston is rich beyond his wildest dreams! He's got his own pad, his own limo driver, and he's spending the money like there's no tomorrow! The only problem with having a million dollars is keeping it – especially when the FBI and the bad guys are after the loot! Join the spending spree of a lifetime as Preston tries to hang on to the cash – and you cash in on the laughs! 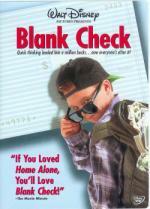 Totally implausible Disney film about a boy who comes by a blank check and cashes it for a million dollars. Some funny bits, but not many. The highlight of this one was Rick Ducommun, better known as the nosy neighbor Art from The Burbs. He's one of those comedian actors who they don't even give a script to... they just let him improvise his lines just to see what he is going to say and it is often hilarious! I'm used to seeing Miguel Ferrer play a sleazeball, and he does it quite well, but in a 'G' rated family movie it stinks of blasphemy. It's rare to see an actor who normally plays hardened criminals or scumbags make the transition to family fare and make it work. Joe Pesci pulled it off in the Home Alone flicks, but that was a rare exception. Kids in the 6-12 age group might like this and have some laughs, but for just about anyone else it's sure to be a bore. I really enjoyed this as it was so much more than I was expecting which was a lame comedy that spoofed Vampire movies. Boy was I wrong! While there was some comedic elements, this was the first of what I'm sure will be many entries into an ongoing story about warring vampire factions. Gorehounds looking for buckets of blood will be disappointed.... but what this movie lacks in gore it makes up for with story and mystery. The two young male leads, Josh Hutcherson and Chris Massoglia were good but the casting for those characters could be completely interchangeable with any multitude of young actors. The real strength of this movie lies in it's veteran cast. John C. Reilly shows us once again that he has leading role savvy as the central vampire, Larten Crepsley. Now if someone could only convince him to stay away from Will Ferrell.... Willem Dafoe, in a rather limited role, clearly pays homage to Vincent Price and is marvelous! His final scenes in this one tease us with the promise of more from him in the forthcoming sequels. Salma Hayek, as the bearded lady, was fine as well, although really... who was looking at her beard?? Throw in Ken Watanabe, Patrick Fugit, Orlando Jones and others in their roles as the various 'freaks', each with their own potential stories to explore made for a spectacular collection of characters and endless possibilities in what should be a franchise. I checked on IMDB and do not see any news of a sequel yet, but I'd be shocked if this one doesn't play out much much more. Looking forward to the continuing of this story and would recommend this movie to fans of the genre! Academy Award® winner Meryl Streep (Sophie's Choice, Kramer vs. Kramer, The Bridges of Madison County, The River Wild, One True Thing) delivers a powerful and uplifting performance in this story of one family's strength and courage in a time of extreme crisis! Plunged into emotional and financial hardship, a devoted mother (Streep), a hardworking father (Fred Ward — Enough, Road Trip, Corky Romano) and the rest of this close-knit family face a decision that will change their lives forever. As time and options begin to run out, they must find the courage to overcome incredible odds. Widely praised by critics — you'll find this compelling story of determination and hope both entertaining and inspirational! Powerful and at times heartbreaking, this delves into the world of epileptic seizures in young children. Based on a true story, it tells the story of a family struggling to endure the hardships, both financial and emotional, from their young son's epilepsy. The movie focuses on the barrage of constant drugs and the horrendous side effects, which seem to make the youngster worse, the potential for brain surgery, which could kill him, and a simple, benign treatment called the Ketogenic Diet which many of the medical professionals failed to disclose to the parents as an option, and discounted out of hand as an unproven 'home remedy'. Jim Abrahams, the film's director, had an invested interest in this film as his son was epileptic and was successfully treated by the fasting diet. He raises the question of a conspiracy to suppress the information of the treatment by a large proportion of the medical community, as it would point a damning finger towards the many years and millions of dollars put into drug therapies that achieved little results. Also the diet earns the drug companies not one red cent. Through media coverage, this movie and crusading parents such as those portrayed by Meryl Streep and Fred Ward in this film, the Ketogenic Diet is now employed worldwide as a first line of defense before drug therapies are even considered. Meryl Streep was brilliant as the relentless mother who defied all the doctors and practically willed her son back to health. While at times this was difficult to watch, seeing what that poor boy had to go through, it was nonetheless gripping. One of the best dramas I have watched in some time. I also liked The Vampire's Assistant. It's not a high-rated film, but perfectly entertaining. It's based on a series of books, I think, which is probably where the episodic feel came from, but maybe it wasn't successful enough to grant sequels. A reluctant hero. An epic journey. A choice between the life he left behind and the incredible new world he's learned to call home. Return to James Cameron's AVATAR -- the greatest adventure of all time. I finally decided to throw this in and see what all the hoopla was about. What can I say?? I went into this movie determined to very critical of it so that I wouldn't be one of the masses throwing gobs of praise onto this movie..... when it was over... I loved it! So much for determination. This movie is going to be phenomenal on Bluray in High Def and it makes me want to expedite the purchase of my first Bluray player. Even in standard dvd format the effects, the colors, the visuals... all stunning. Very good cast across the board, humans and blue people alike. Sigourney Weaver was a standout but for me the most intense, stellar performance went to Stephen Lang as Col. Quaritch. Hooyah! He was the embodiment of heartless evil and yet I was oddly sad to see him check out. There was no shortage of statements and morals for Cameron to preach from his $2.8 billion dollar worldwide pulpit.... among them corporate greed, environmental exploitation, prejudice, unprovoked military sanctioning, and tainted foreign policy. It was really no surprise that despite it's enormous success, the film did in fact piss off a lot of people. The Earth Day release of the DVD/Bluray was a further poke in the eye of the pundits of the film and cemented the reverence of James Cameron that much more. Marketing genius! It's actually based on the first 3 of a series of 12 young adult vampire books by Darren Shan. So there is scope for sequels. The past-and the future-close in on a reformed gunslinger. Like Alan Ladd's Shane, Gregory Peck's The Gunfighter and Clint Eastwood's Unforgiven, The Lonely Man belongs to that saddlebag full of Westerns bout a gunslinger coming to terms with his infamous past and uncertain future. Jack Palance stars as Jacob Wade, a notorious outlaw trying to ride the trail of respectability. But where Wade goes, his reputation follows. And so does trouble. Fearful citizens are quick to turn him out of their town. Vengeful killers have vowed to stalk him to his grave. And Wade's son (Anthony Perkins), embittered over his father's long absence, cannot quell the pain and hate in his heart. Neville Brand, Lee Van Cleef, Claude Adkins and Elisha Cook co-star in this spare, ruggedly entertaining sagebrush saga. Lackluster western that had potential but just couldn't deliver. Jack Palance was solid as a gunfighter trying to live a peaceful life but his past won't leave him be. This story has been told before... much better told in Unforgiven actually. A great cast alongside Palance including Anthony Perkins, Neville Brand, Lee Van Cleef, Claude Aikens and even Denver Pyle in a small role. Aikens, who always made a statement no matter what role he had, doesn't disappoint in his small part here either. That man always had great presence on screen. Perkins, playing Palance's hateful son, portrays a teenage boy who is just too pathetic for words. Whiny, weak, slovenly... you keep waiting for the moment that he finally grows a spine and becomes a man and it just never happens. Even after the predictable finish I was still expecting for him to finally begin to resemble even a smidgen of the man his father was and instead the movie just abruptly ends. Booooo! Hard-hitting action, cross-country adventure...and a government conspiracy that goes all the way to the top! In this pulse-pounding political thriller, action superstar Charles Bronson is at his rugged best as a man on a mission to protect the First Lady from ruthless assassins who'll stop at nothing to kill her! When veteran Secret Service Agent Jay Killian (Bronson) is assigned to protect the president's pampered and difficult wife (Jill Ireland), he knows she will be a handful. But what he doesn't know is that assassins are out to kill her! Not only must Killian use his lethal experience to shield the First Lady from danger...he must also do it while tracing her would-be murderer to the highest office in the land! I searched long and hard for this movie and finally caved in, buying it brand new from Deep Discount. One of my favorite Bronson movies, it has been quite a few years since the last time I watched it and it seems to have lost some of it's appeal. I'm not sure why... perhaps because it seems a bit dated now. Bronson is still a marvel to watch though... the ultimate tough guy. I used to be such a fan of all those Golan-Globus, Canon films of the 80's. In California, 1936, intermarriage is illegal. Jack McGurn (Quaid) and Lily Kawamura (Tamlyn Tomita) must elope to Seattle, where they soon have a daughter. But when Pearl Harbor is attacked, Lily, her family and thousands of other Japanese-Americans are "relocated" to internment camps. As Jack tries desperately to keep his family together, the grim specter of war threatens to tear them apart! Story of an American man who marries a Japanese woman a few short years before the attack on Pearl Harbor. He then struggles to keep his family together as his wife, daughter and other family members are sent to internment camps. I watched this movie with great interest as I always felt that the confinement of the Japanese, many of whom were US citizens, was one of the greatest travesties in US history. Completely unconstitutional, for many of them the only way out was to renounce their country of origin, join the army, and go fight their former countrymen on Japanese soil. Dennis Quaid played the American who fought the system all his life and made whatever sacrifices were necessary to be with his family. He was good, but Tamlyn Tomita was fantastic as his beautiful wife who was outcast by her father for being with an American. Her performance was strong, dignified and she is angelic in appearance. I noticed from her IMDB resume that she is mostly a TV actor which is a pity as I'd love to see more films with her. Great storytelling of an event the government would like to forget ever happened. In 1982 a reporter visiting Levy County in Florida noticed a lack of black residents. So he asked questions…and a long-ago tragedy came to light. John Singleton directs Jon Voight and Ving Rhames in this powerful true drama. It is January 1, 1923 in Rosewood, but in this largely black town built on family, faith and hard work, hopes for the new year abruptly end. In a few harrowing nights, a white mob razes Rosewood into oblivion. As the rampage gains cataclysmic force, a heroic World War I veteran (Rhames) and a shopkeeper (Voight) join forces. Dozens of terrified women and children have fled into nearby swamps. Somehow they must be led to safety. 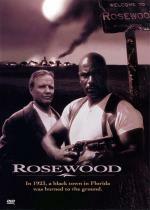 In my opinion, Ving Rhames' best performance of his career.... as a drifter looking to stay out of trouble but unable to do so as he is looked upon as a savior to the terrorized black community of Rosewood. Based on a true story, this movie holds nothing back as it shows us deep racial prejudice in all it's ugliness. An entire town wiped out by men who when they couldn't find a reason to act upon their hateful prejudices simply made one up. Strong cast made up by Rhames, Jon Voight as the solitary white man of reason who sacrifices much in order to save as many people, mostly women and children, as he can... Esther Rolle (from Good Times!) as the kindly Aunt Sarah, and her idealistic son, played by Don Cheadle. Michael Rooker, who seems to be a mainstay in these types of films, plays the town sheriff who tries to do the right thing but quickly loses control and ultimately joins the murderous lynch mob. Bruce McGill gives a powerful performance as the central bigot who whips the mob up into rabid frenzies time and time again, all the while attempting to groom his young son into sharing his hateful beliefs. The events portrayed would be shocking in any film. To know this really happened, and likely played out in similar veins many times over in the south during that shameful time of American history is repulsive and saddening. I'd seen this movie before several years ago. It was no less compelling that the first viewing and I feel it has an important place in film making. Ving Rhames seems to be another relegated to straight to video flicks now but this movie showed what he is capable of. A must watch. This is definitely one of those forgotten gems of the 90's. I remember renting it one night back in 1999 and was thoroughly pleased with it.